The state of many estate roads in MK has been a big problem. Thanks to the Lib Dem councillors on MK council the problem policy was changed after the elections in 2018 based on MK Lib Dem policy, and the state of many of our roads and paths are finally starting to improve. For a number of years the bad state of the roads in Milton Keynes have been a growing problem with residents frustrated about why the council hadn’t been fixing many large holes in our roads. Many had assumed money was the main problem, however the real problem was council policy about what a pothole was. Yes, a pothole to a normal person didn’t always count as a pothole for MK council and staff hands were often tied. The policy had been that staff would go out to measure to check what needed fixing, and if a hole was less than 5cm/50mm it wasn’t a pothole. Council staff were fixing everything they were supposed to. 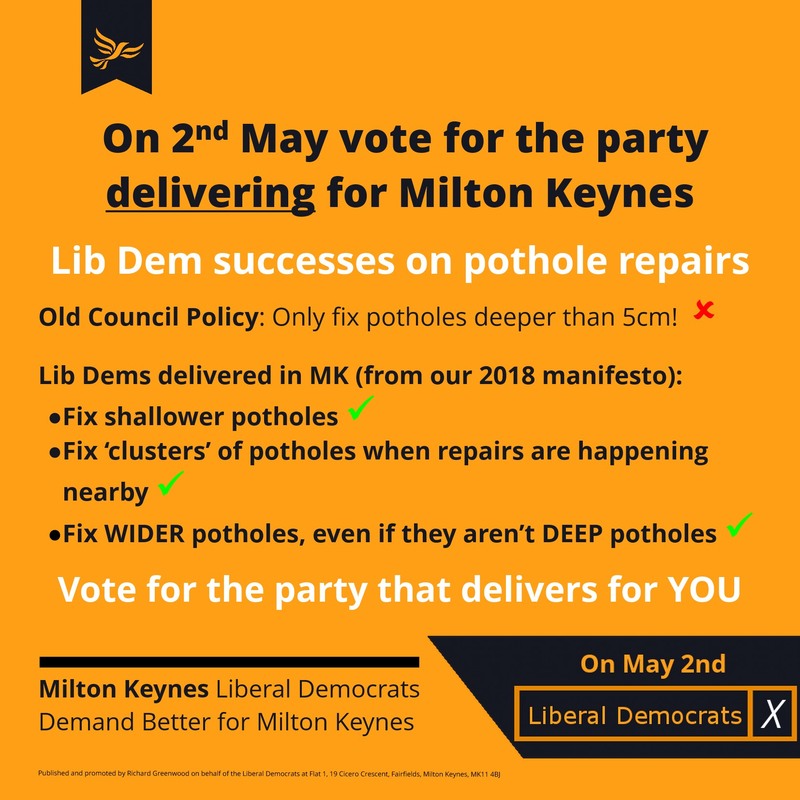 Ahead of the 2018 local elections in MK the Labour and Tory parties were falling over themselves to promise to fix more potholes than the other party, however neither were talking about the real problem that council policy needed fixing. The one party with councillors who came up with a good change that would start repairing our roads was the Liberal Democrats. After the elections, despite not being the group running the council our changes were reviewed and they were agreed, the only exception being that the intervention level was set at 40mm/4cm, which we will keep fighting to reduce further. The change has been a big success and the state of our roads are now improving thanks to our Lib Dem councillors. We will still continue fighting for our roads and paths in Milton Keynes to be better maintained so they are safe to use for all residents, including changing the intervention level down still further. Our long term aim is that when staff go out and find potholes in our roads and paths they don’t spend time measuring them, they just fix them.